Matt Holmes, of Santa Cruz, Calif., cuts into a log Wednesday, the first day of the 13th Whittle the Wood Rendezvous in Loudy-Simpson Park. Eleven contestants are entered in event, which also includes free concerts and an arts and craft show. Unless otherwise noted, all events take place at Loudy-Simpson Park, 500 S. Ranney St.
• 8 p.m. “The Congress” performs at J.W. Snack’s Bar & Grill, 210 E. Victory Way. There is no cover charge, but all attendees must be at least 21. Call 826-0468. More than two decades have passed since Robert Waits punched a timecard. He’s earned his bread through decorative woodcarving for 21 years and counting. From his shop in Lander, Wyo., samples of his handiwork have found their way to locales across the globe, he said. Waits, a nine-year participant in the annual Whittle the Wood Rendezvous carving competition, spread his arms wide Wednesday morning at Loudy-Simpson Park and smiled. His work is everywhere, even in Craig, “here in all this grandeur,” he said as the roar of chainsaws nearly drowned out his words. That sound and smell of fresh-cut wood was a telltale sign that one of the city’s biggest events of the year was underway. 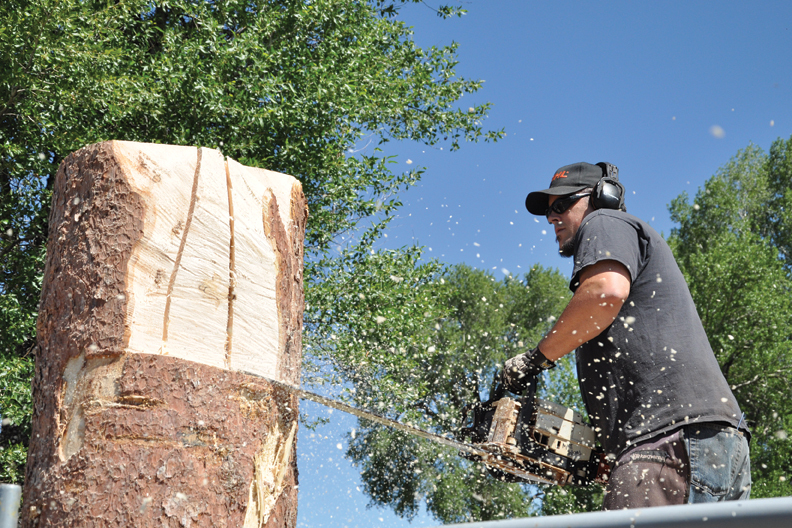 Waits and 10 other carvers fired up their chainsaws Wednesday morning at the park, kicking off the four-day event that includes free concerts, food and beer vendors and a carving competition, the 13th annual festival’s signature attraction. Residents can watch sculptures-in-progress take shape from 9 a.m. to dusk today at Loudy-Simpson, 500 S. Ranney St. Entries also can be viewed throughout the day before they are sold in a silent auction that closes at 4 p.m. Saturday. Half of the auction proceeds go to the carvers, and the remainder goes back to the City of Craig to help pay for the event. Sculptures can fetch anywhere from $50 to $500, depending on size, said Dave Pike, Craig Parks and Recreation director. Competitors also show off their skills in a quick-carve competition that starts at 1 p.m. Saturday. Carvers have an hour to produce sculptures that an auctioneer will sell to the highest bidder. As competitors took the first cuts out of totem-sized logs lined up at the park, they each had a different vision of what the finished product would look like. Danny Zeadker, of Wauseon, Ohio, envisioned a sculpture involving a bear, a boat and a fish. “It’s my signature piece,” he said. But in his 12 years as a wood carver, he’s learned it’s best not to be dead-set on one design. Sometimes the wood has other plans. “The log always wins,” he said. He is one of five artists participating in Whittle the Wood for the first time this year. Others, like four-time competitor Ken Braun of Cortez, are familiar faces at the event. For his entry, he imagined a man besieged by spiders. “I like carving things that are different” and that “evoke an emotion in somebody,” and a legion of creepy-crawlies seemed to fit the bill, he said. For Braun, competitions are an opportunity to mingle with other artisans who transform stumps and logs into works of art. Whittle the Wood is no exception in his mind. The event is a stage upon which to create “something magnificent,” he said. For more information about Whittle the Wood, call 826-2029 or visit http://www.whittlethewood.com.